When it comes to keeping up with latest trends there are those who seem to, for their discerning style, or those with access to boundless amounts of the old Mula and/or those that are connect to those who are in the know seem to own the must have fashion accessory of tomorrow, the TV with smarts most of us haven’t caught on to… you get the idea. In technology (and most other things) sometimes the take up of new devices can be categorised into 3 main groups. Those who live on the bleeding edge - they end up buying an item that has the potential to be the next next-thing. It could also be the one that doesn’t make it. Those who pursued that trend end up “bleeding” if the product doesn’t make it. Consider for example back in the mid 70’s (years before the DVD) Sony introduced the Beta format for home VCR’s. 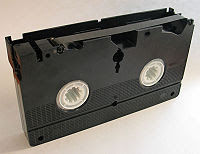 At around the same time the VHS standard was launched. Even though it can be argued that the Beta format was technically a superior product, the VHS won out at the end. Incidentally, in one episode, Homer Simpson is seen in a Video store searching frantically for movies in the Beta format. That kinda says it all. Others live in what is commonly regarded as “fast followers”. They don’t take the huge risk of being first buyers, however, they are not too far behind. The third group are those who are on the "leading edge". Somewhere in between the fast followers and the bleeding edger’s. Today I came across an Australian site called “The Cool Hunters” (website below) that seems to, as the name implies, search the globe for ideas, products, events that are trend setting “cool” even.